Egyptian police clashed with Muslims after they attacked a church and injured passersby in the Mediterranean city of Alexandria, angered over a DVD they consider anti-Muslim. "Nearly 5,000 faithful gathered after Friday prayers as they exited from a mosque in the Moharem Bek area in Alexandria and proceeded towards the Mar (Saint) Girgis church," the interior ministry said. "A police force tried to prevent the protesters from approaching the church and attacking it, but they did not heed police warnings and stoned the church, the force and passersby, which resulted in injuries," the ministry said. What, pray tell, would motivate 5,000 Muslims to emerge from Friday prayers to attack a church? Apparently they were so outraged by a play that implied that a Muslim sheikh might tell his followers to attack a church that they marched right out from their Friday sermon and, er, attacked a church. Islamists mounted two protests outside the church last week following the DVD release of a play produced by Saint Girgis two years ago. The play, performed by amateur actors, tells the story of a young Christian who converts to Islam and is exhorted by a sheikh to kill priests and destroy churches, according to the independent Al-Dustur paper. Please. Nobody "tell the story of a young Christian who converts to Islam and is exhorted by sheikh to detonate a nuclear weapon in an American city." Good thing Islam means peace. The Religion of Peace in action. You can make this stuff up. But you don't have to, because it will happen in real life whether you do or not. 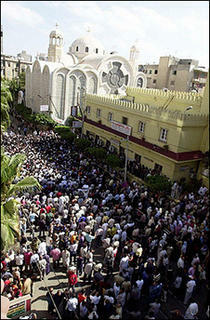 It's amazing there are any Coptic churches left in Egypt at all. In Egypt they've merely been persecuted relentlessly. In the rest of the ME various early church groups were annihilated. We have only the smallest inkling of what Western Christianity lost when the Muslims killed everyone who didn't convert. It was here that the Desert Fathers, personified in St. Anthony, created monasticism. Later, in the West, St. Benedict revitalized Anthony's original ideas. And that makes me wonder how the Coptics managed to hold on, or why they're not all dead now. African Americans ought to look into the lives Coptic Christians live in Egypt; it would give them some insight into *real* present-day oppression. Agreed. Christendom does not have entirely clean hands in this regard either, but two wrongs don't make a right. Another question: Why do these sorts of things seem to happen on Friday afternoons? How covert was Valerie Plame? Will European pacifism wither away? Uh oh, Tigerhawk's favorite show is under attack!